Animals is one of those albums that can be easily missed, which is a great shame. Coming as it did in that time of great flux for the UK music scene, it is an interesting album. For many at the time, particularly in the pro-punk media, this was a perfect example of what they were fighting against: long, ponderous songs with seemingly endless guitar solos, lacking the immediacy and energy of the new bands. Coming as it did, though, at the start of 1977, it caught me on the cusp, and still was able to thrill this then young rocker with its complexity and dexterity. The album sleeve, the work of Aubrey Powell and the team at Hipgnosis, has become iconic, with the inflatable pig tethered over what was then Battersea Power Station. It is hard not to see this landmark and not think of the album. For the band this album is, it seems to me, a transitional one. 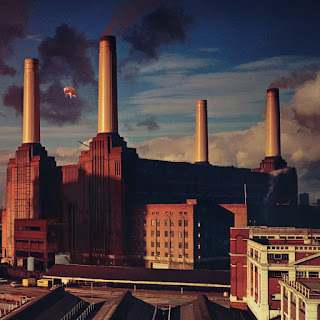 It draws on many of the musical ideas in the 'big' albums, and there's a particular hark back for me to the title track of Wish You Were Here in the 'book-end' acoustic tracks, 'Pigs on the Wing 1 & 2', just perhaps a little simpler as a song. But between these short songs come the three epics, each in their way pointing to what the band would become over the next two to five years. 'Dogs' is for me the stand-out track, and the only one that Roger Waters lets anyone else have a part in writing. It seems to be a prophetic statement of how the UK would develop over the coming decade under the influence of Thatcherism and rampant capitalism, and its inevitable consequences. In 'Pigs' and to a certain degree in 'Sheep' too, Waters is starting to get his angry head on. Maybe not yet as outspoken as he would be in The Wall and to a greater degree in The Final Cut and his solo material that followed, but it is still there. His targets are greed, hypocrisy, censorship, and that fact that perhaps you can only keep people down for so long before they take back what is theirs. This may well be seen as a coming of age album for the band, as they graduate from the spacey, psychedelic soundscapes of their early days, and the grand symphonic swathes of their pomp, to a more outspoken protest rock, almost. Perhaps it began to sow the seeds of the band's transition to stadium-filling mega stars and the inevitable self-destruction of the old order that accompanied it. This is, for me, one of the band's best works: different from what preceded it and what followed, but transitional and perhaps seminal for the band's ultimate direction.